Boat accidents can be caused by multiple factors, some of which may simultaneously contribute to a single crash. When these factors involve the negligence or carelessness of boat operators or others, accident victims can have various options for holding the negligent parties accountable and seeking financial recovery for their injuries and losses. For decades, the Houston lawyers at the Amaro Law Firm have been dedicated advocates for boat accident victims, helping them pursue all available legal remedies. Effective at protecting our clients’ rights and advancing their interests, our attorneys can help you pick up the pieces and seek the justice and compensation you deserve in the aftermath of a boat accident. During your FREE consultation, we will review your potential claim, explain your rights and advise you of the legal options for proceeding. Free virtual and mobile consultations are available to anyone who cannot visit our offices. Operator inattention – Distracted, inattentive boat operators are considered to be the number one cause of boating accidents, according to the U.S. Coast Guard (USCG).1 While operator inattention can lead to accidents with other vessels or fixed objects (like piers), it can also result in accidents when boating operators fail to promptly, appropriately respond to volatile water, and/or weather conditions. Operator inexperience – Operators who fail to obtain the necessary safety training2 are far more likely to violate boating regulations or engage in other risky behaviors that can cause accidents. 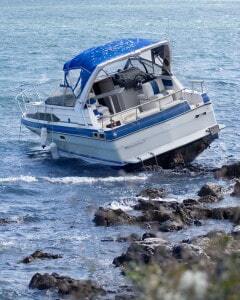 In fact, according to the USCG,1 operator inexperience is the 2nd leading cause of recreational boat accidents. Boat equipment malfunctions – Mechanical failures are the 5th leading cause of boating accidents, causing at least 320 accidents and 115 injuries each year.1 While these equipment failures can be the result of boat owners or operators failing to properly maintain their vessels, they can also arise from inherently flawed or dangerous equipment being installed on boats. Boats are taken out in poor weather or in low-visibility conditions. Those on the boat are not wearing life jackets (that have been approved by the U.S. Coast Guard). Boats are overloaded with passengers and/or cargo. In the immediate aftermath of a boat accident, the precise cause(s) of the wreck may not be obvious or readily apparent. Figuring out the factors that did contribute to the accident, however, will be the key to determining the available legal remedies and options for financial recovery. Records from onboard “black boxes” (when available). When it is time to seek compensation for the losses, injuries and devastating impacts of a boating accident, it is time to contact an experienced Houston boat accident lawyer at the Amaro Law Firm. Call (877) 892-2797, text (281) 612-8024 or email our firm for your FREE, no obligations consultation and essential answers about your rights, your potential claim and your legal options for moving forward. Backed by decades of experience, our attorneys have the insight and skills to help boat accident survivors – as well as families who have lost a loved one to a boating accident – build the strongest possible claims and maximize their recoveries. While we understand that compensation can never reverse the losses and impacts of a boat accident, we also know how crucial compensation can be to providing survivors and families with the financial means to seek treatment, focus on healing and rebuild their lives. Testimonials from former clients, as well as our 5-star ratings on Google and Facebook, affirm our history of extraordinary representation and success in boat accident (and other) claims.